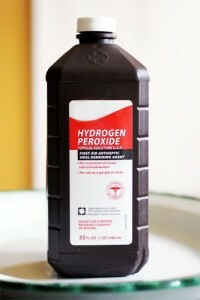 Hydrogen peroxide is one of the cheapest products that you can find in the store. Although this product is extremely inexpensive, it has a number of useful qualities. One of the most popular uses of hydrogen peroxide is to treat ear infections. It can help to soothe ear pain, treat swimmer’s ear and remove ear wax. Additionally, it helps to promote fast healing and can be used to sanitize cuts. Sold over the counter, this product is pale blue and has a chemical formula of H2O2. When used safely, hydrogen peroxide offers a number of benefits for your ears. You should include it in your medicine cabinet because it is a multi-purpose product that is always good to keep on hand. Since there are some dangers of using hydrogen peroxide for the ear, we will make sure to include these precautions as we discuss the potential benefits. Heal Pierced Ears: When you first get your ears pierced, they are extremely prone to getting infected before they heal. Since hydrogen peroxide kills bacteria and viruses, it can prevent infections in your new piercings. Natural Solution for Ear Infections: When you get an ear infection, you do not always want to go to the doctor. If you scraped or cut the inside of your ear, hydrogen peroxide can prevent bacteria from causing harm. Reduce the Chances of Colds or the Flu: According to some natural remedy practitioners, hydrogen peroxide can prevent you from getting a cold. Using a small amount of hydrogen peroxide in your ear it thought to prevent a cold or limit its severity. This may be due to its ability to get into your sinus passages where it could kill viruses. Remove Ear Wax: Although your body naturally removes ear wax build up on its own, you may want to help your body along the way. As wax builds up, it could block your hearing or feel uncomfortable. Hydrogen peroxide works to soften the wax and make it easier to remove, so you are left with cleaner ears. Hydrogen peroxide should never be used internally. If your ears hurt, discharge fluid or you cannot hear as well, talk to your doctor. This could be a sign of a serious problem, so you will need medical help to treat it. In addition, you should be cautious about using hydrogen peroxide if you have sensitive skin. You may want to avoid using it altogether or dilute the concentration. If you recently had your ears pierced, you will need some clean cotton swabs and hydrogen peroxide. Start by washing your hands with soap and water. Afterward, place some hydrogen peroxide onto the cotton swab. Use this swab to brush the areas around the piercing and allow it to dry. This technique works best if you use it for three times a day until your ear piercings are fully healed. Keep in mind that you should go to the doctor if you feel significant pain. Any fluid from the ear or hearing problems are a sign that you need extra help, so talk to your doctor about your worries. When it comes to an ear infection, using hydrogen peroxide can help. It works best for an infection that occurs in your outer ear. To get started, you will need an eye dropper, a towel, warm water, cotton balls, rubbing alcohol, a bulb aspirator and hydrogen peroxide. Turn your head so that the affected ear is facing the ceiling. With the eye dropper, place two drops of hydrogen peroxide into your ear. Sit for 10 to 15 minutes while the hydrogen peroxide bubbles. Afterward, turn your head so that the hydrogen peroxide can drain. Every two to three days, use a bulb aspirator to get rid of any earwax. Following your treatment, use some rubbing alcohol and a cotton ball to get some into your ear before allowing it to drain out. 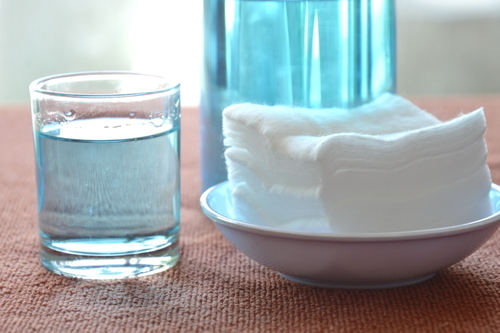 If you want to reduce your chances of having a cold, get some cotton swabs, an eye dropper a 3 percent mixture of hydrogen peroxide and a towel. With one ear facing the ceiling, use an eyedropper that is about a quarter filled to put hydrogen peroxide into your ear. Allow the bubbling to continue until it stops. Afterward, allow your ear to drain before cleaning your ear with a cotton swab. Do this for your other ear and repeat for up to three times a day. For an easy earwax removal technique, you just need a bulb aspirator, a towel, diluted hydrogen peroxide, an eye dropper, olive oil and cotton balls. Like the previous remedies, tilt your ear toward the ceiling. Use a towel on your shoulder to absorb any spills and use an eye dropper to place three drops into your ear of olive oil. After a few moments, add three drops of hydrogen peroxide. Wait for a few minutes for the bubbling to stop before turning your head for the mixture to drain. Following this, use a bulb aspirator at a 45-degree angle to your ear and squirt warm water into your ear. This will flush the earwax out. Any resulting mess or spills can be dried up using the towel.